This infographic is based on the experience of different clients from different industries in different training programs. I thought this was a solid infographic and should prove to be useful for Instructional Designers, Faculty Members, and/or for Corporate Trainers as well. I might also consider adding a “Gotcha!” piece first — even before the welcome piece — in order to get the learner’s attention and to immediately answer the WHY question. WHY is this topic important and relevant to me? When topics are relevant to people, they care and engage a whole lot more with the content that’s about to be presented to them. Ideally, such a piece would stir some curiosity as well. 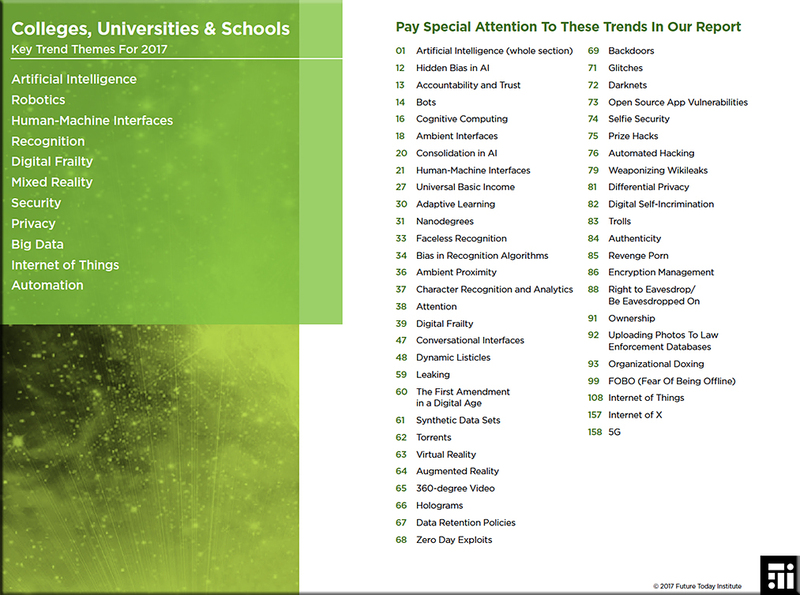 This year’s report has 159 trends. This is mostly due to the fact that 2016 was the year that many areas of science and technology finally started to converge. As a result we’re seeing a sort of slow-motion explosion––we will undoubtedly look back on the last part of this decade as a pivotal moment in our history on this planet. 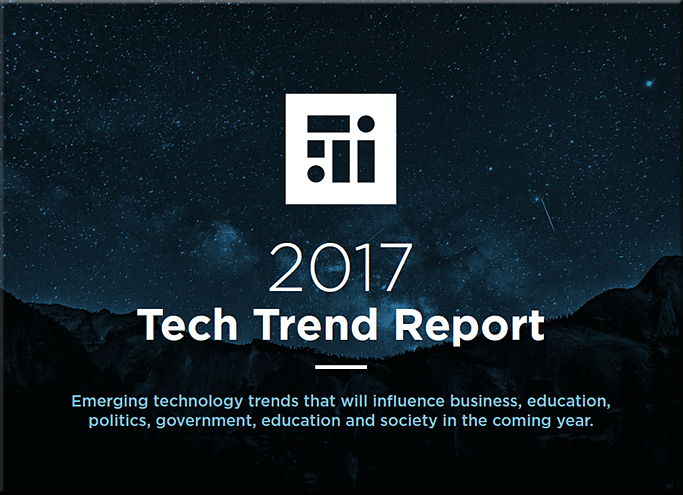 Our 2017 Trend Report reveals strategic opportunities and challenges for your organization in the coming year. 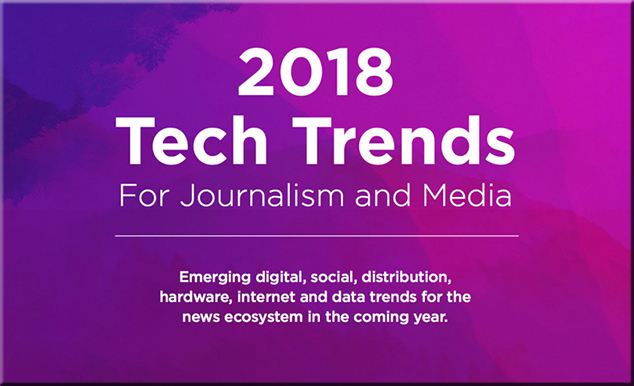 The Future Today Institute’s annual Trend Report prepares leaders and organizations for the year ahead, so that you are better positioned to see emerging technology and adjust your strategy accordingly. Use our report to identify near-future business disruption and competitive threats while simultaneously finding new collaborators and partners. Most importantly, use our report as a jumping off point for deeper strategic planning. Augmented and virtual reality offer ways to immerse learners in experiences that can aid training in processes and procedures, provide realistic simulations to deepen empathy and build communication skills, or provide in-the-workflow support for skilled technicians performing complex procedures. Badges and other digital credentials provide new ways to assess and validate employees’ skills and mark their eLearning achievements, even if their learning takes place informally or outside of the corporate framework. Chatbots are proving an excellent tool for spaced learning, review of course materials, guiding new hires through onboarding, and supporting new managers with coaching and tips. Content curation enables L&D professionals to provide information and educational materials from trusted sources that can deepen learners’ knowledge and help them build skills. eBooks, a relative newcomer to the eLearning arena, offer rich features for portable on-demand content that learners can explore, review, and revisit as needed. Interactive videos provide branching scenarios, quiz learners on newly introduced concepts and terms, offer prompts for small-group discussions, and do much more to engage learners. Podcasts can turn drive time into productive time, allowing learners to enjoy a story built around eLearning content. Smartphone apps, available wherever learners take their phones or tablets, can be designed to offer product support, info for sales personnel, up-to-date information for repair technicians, and games and drills for teaching and reviewing content; the possibilities are limited only by designers’ imagination. Social platforms like Slack, Yammer, or Instagram facilitate collaboration, sharing of ideas, networking, and social learning. Adopting social learning platforms encourages learners to develop their skills and contribute to their communities of practice, whether inside their companies or more broadly. 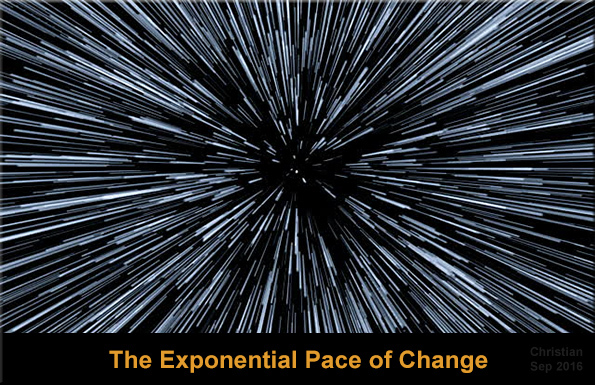 xAPI turns any experience into a learning experience. Adding xAPI capability to any suitable tool or platform means you can record learner activity and progress in a learning record store (LRS) and track it. Everyone in the learning arena learns to recognize weak signals; they work with technologists to refine artificial intelligence to instill values. Future machines learn not only to identify correct and incorrect answers; they also learn right and wrong. Webb said that she gives this optimistic scenario a 25 percent chance of occurring. Everyone present is inspired by her talk but they, and the rest of the learning world, do nothing. Artificial intelligence continues to develop as it has in the past, learning to identify correct answers but lacking values. Webb’s prediction is that this pragmatic optimistic scenario has a 50 percent chance of occurring. 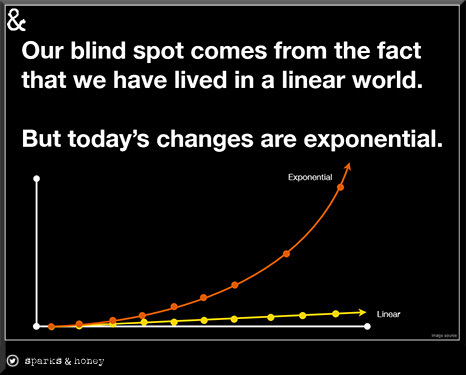 Learning and artificial intelligence continue to develop on separate tracks. Future artificial intelligence and machine learning projects incorporate real biases that affect what and how people learn and how knowledge is transferred. Webb said that she gives this catastrophic scenario a 25 percent chance of occurring. 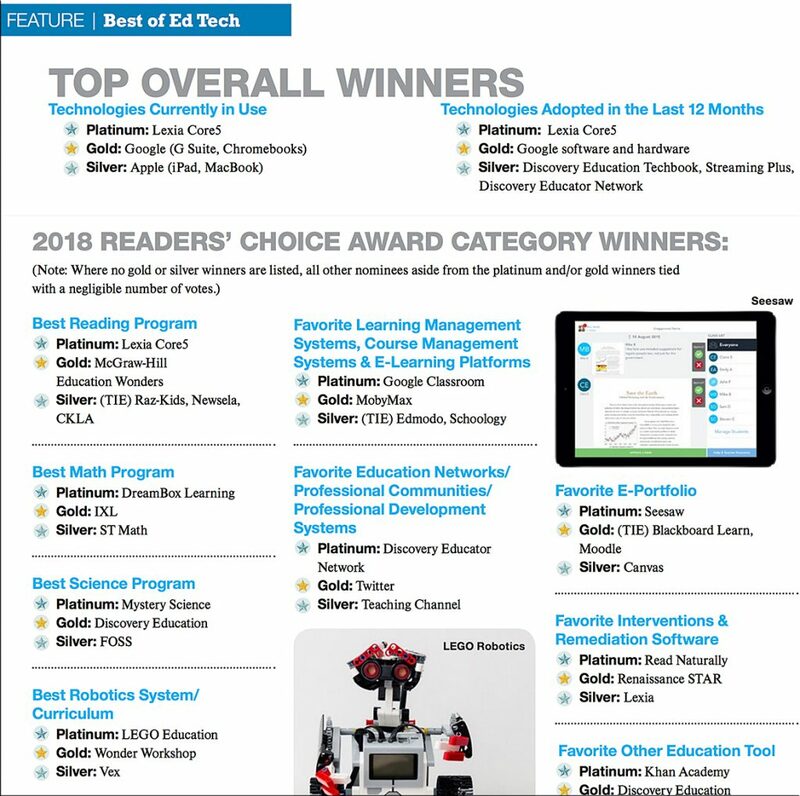 In our second annual Teaching with Technology Survey, faculty revealed what technologies they use in the classroom, the devices they most value, what they wish for and more. 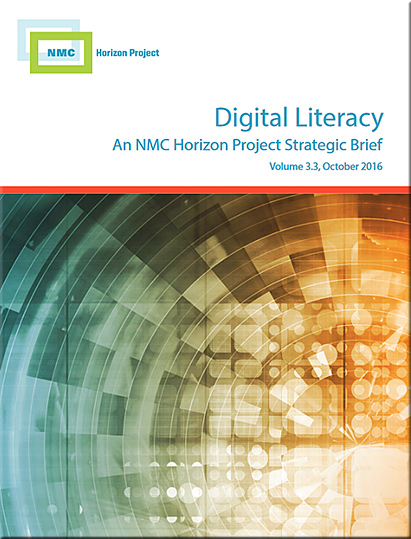 The New Media Consortium (NMC) has released Digital Literacy: An NMC Horizon Project Strategic Brief in conjunction with the 2016 EDUCAUSE Annual Conference. 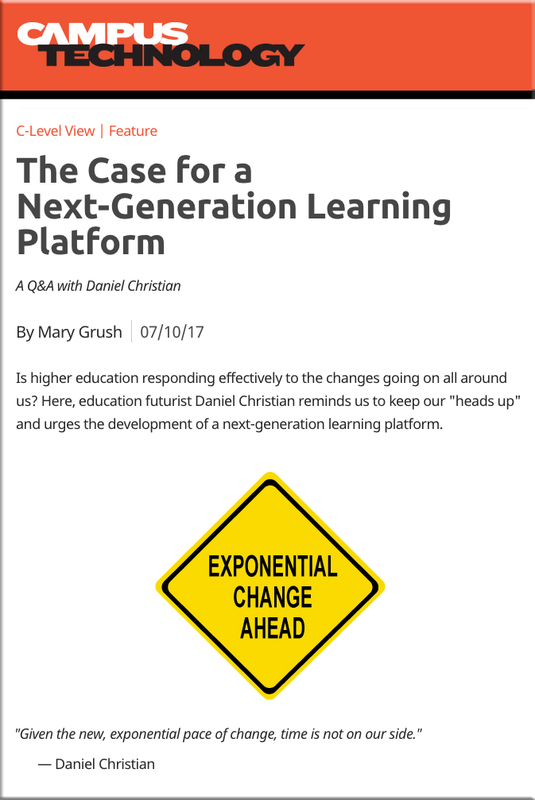 In analyzing the progress and gaps in this area, the NMC’s report has identified a need for higher education leaders and technology companies to prioritize students as makers, learning through the act of content creation rather than mere consumption. 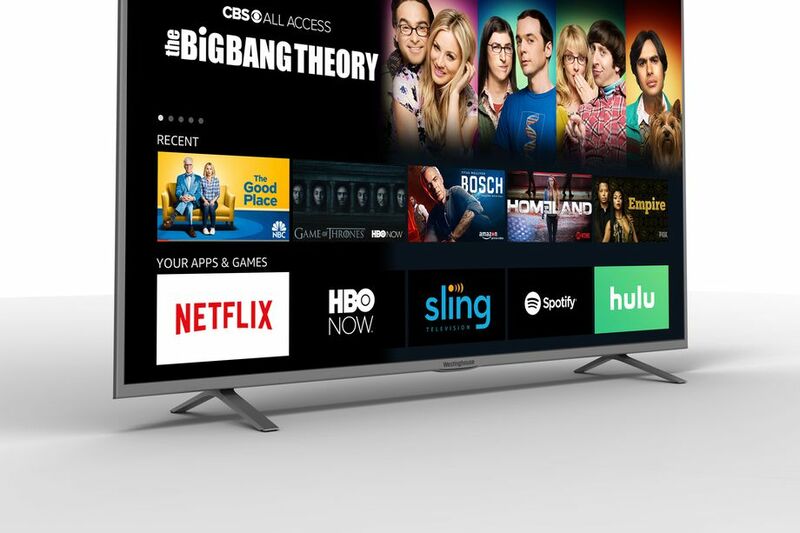 Additionally, the publication recommends that colleges and universities establish productive collaborations with industry, government, and libraries to provide students with access to the latest technologies and tools. 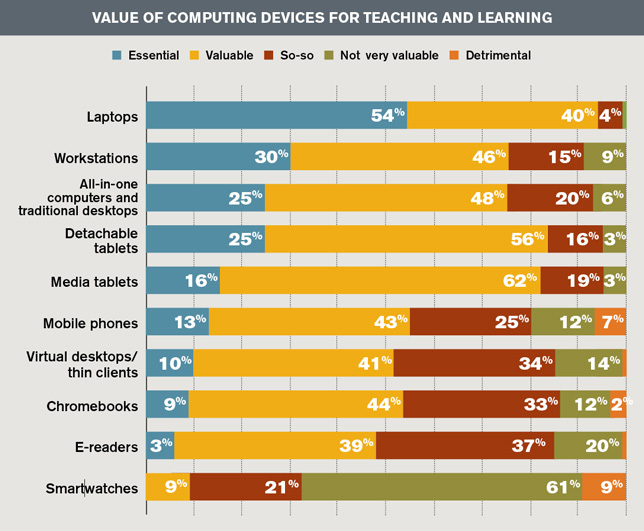 Based on the variety and complexity of these results, NMC cannot identify just one model of digital literacy. 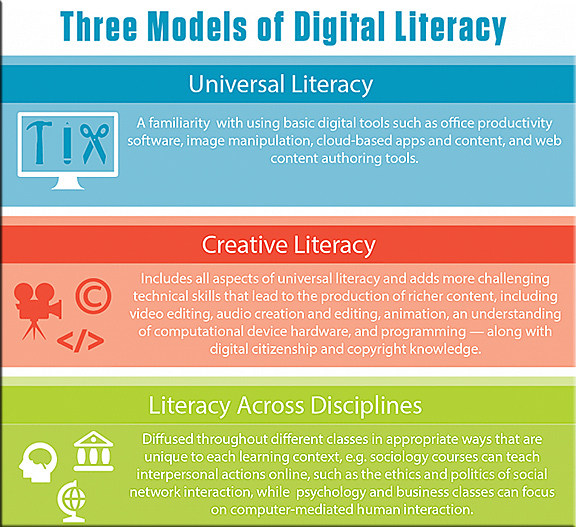 Instead three different digital literacies are now evident, each with distinct standards, potential curriculum, and implications for creative educators. The aim of this publication is to establish a shared vision of digital literacy for higher education leaders by illuminating key definitions and models along with best practices and recommendations for implementing successful digital literacy initiatives. Computer science and digital media classes can instruct on everything from office productivity applications to programming and video editing, for example. Sociology courses can teach interpersonal actions online, such as the ethics and politics of social network interaction, while psychology and business classes can focus on computer-mediated human interaction. Government and political science classes are clearly well equipped to explore the intersection of digital technology and citizenship mentioned above. 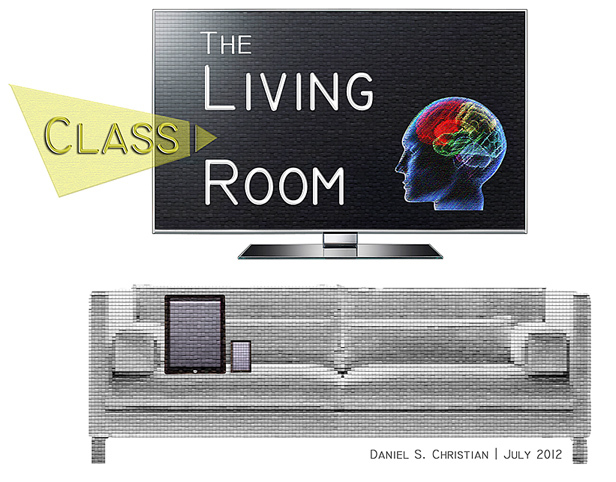 Communication, writing, and literature classes have the capacity to instruct students on producing digital content in the form of stories, arguments, personal expression, posters, and more. This type of situation/perspective is quite costly. Because once students graduate from college, had they built up some solid digital literacy — especially the “creative literacy” mentioned above — they would be in much better shape to get solid jobs, and prosper at those jobs. They would be much better able to craft powerful communications — and reach a global audience in doing so. 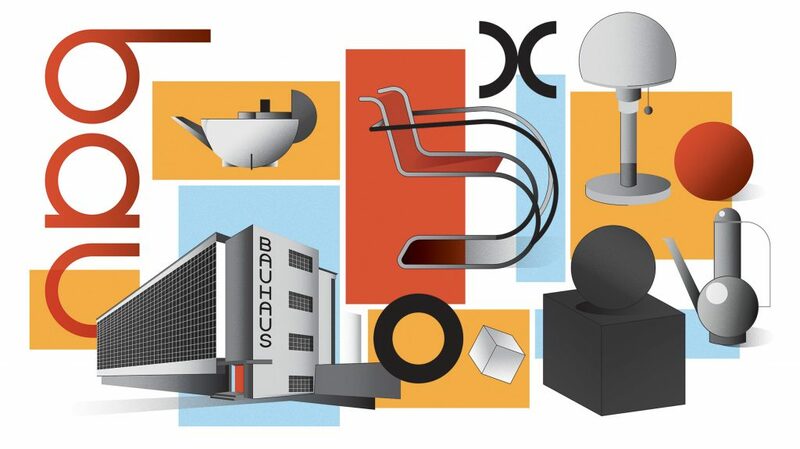 They would have honed their creativity, something increasingly important as the onward march of AI, robotics, algorithms, automation, and such continues to eat away at many types of jobs (that don’t really need creative people working in them). This is an important topic, especially as digitally-based means of communication continue to grow in their usage and impact. Part of digital literacy is not just understanding how a tool works but also why it is useful in the real world and when to use it.